There’s no easy way to put this, Detroit is a disturbingly brutal film to the point where it’s hard to sit in a theater watching it, knowing that this is only a sliver of what actually happened in 1967. Director Kathryn Bigelow is no stranger to these tense, real life horrors as her two films prior were The Hurt Locker and Zero Dark Thirty, both receiving Best Picture nominees with the former winning. The film is shot as if it’s a docudrama with how hectic the camera movement is. The stylistic choice from Bigelow works better compared to the more mundane locked off shot. The camera is always moving, panning back and forth the ensemble. With an Oscar-winning director helming the project and an assortment of promising young actors, this seemed like a perfect fit. Unfortunately something is missing from the film. Clocking in at 142 minutes, Detroit suffers from pacing issues and struggles to maintain its tone and vision. The first act introduces viewers to the ongoing carnage of the city but struggles to find a perspective as it meanders between real life footage and the dramatized story. The story soon transitions to the Algiers Motel where the bulk of the film takes place. There we’re introduced to the majority of the characters, played by some familiar faces. The second act is horrifying as three Detroit Police Officers abuse their authority to terrify the guests, resulting in assault and murder. Easily the strongest portion of the film, Bigelow is able to showcase the talent of her cast and give them all an opportunity to shine. It’s so visceral that it almost becomes unbearable as it leaves a lump in your throat and knots in your stomach. The film concludes with a procedural courtroom piece which fails to leave a lasting impression or impact on the film. Titled Detroit, it seems as if the Michigan city has been sidelined. Yes the film prioritizes one notable event but it seems like the city itself takes a backseat to a much more conventional period thriller. At times the dialogue seems watered down and unsure of what and whose story is trying to be told. It’s unclear as to who this film is being made for, both races are being shown in a negative light and it’s hard to find the political statement Bigelow is trying to make. As the credits roll very little resonates with how muddled and hollow the script is. Instead of informing the viewers of the Detroit riots they choose to emphasize the police brutality while downplaying the trauma felt from the victims. John Boyega does great work with what he’s given. His character often serves as an onscreen perspective for the viewer as he uses his face to react instead of his voice. Both Jack Reynor and Ben O’Toole are great as despicable Detroit Police Officers who find themselves involved with a group of guests at the Algiers Motel. The standout performance is without a doubt Will Poulter who plays the ruthless ringleader who terrorizes the guests and will stop at nothing to get the answers he is looking for. You despise his character so much and that’s in large part due to his incredible performance. Poulter’s role ranks as one of the best villain performances in recent years and he’ll definitely get some recognition come award season. 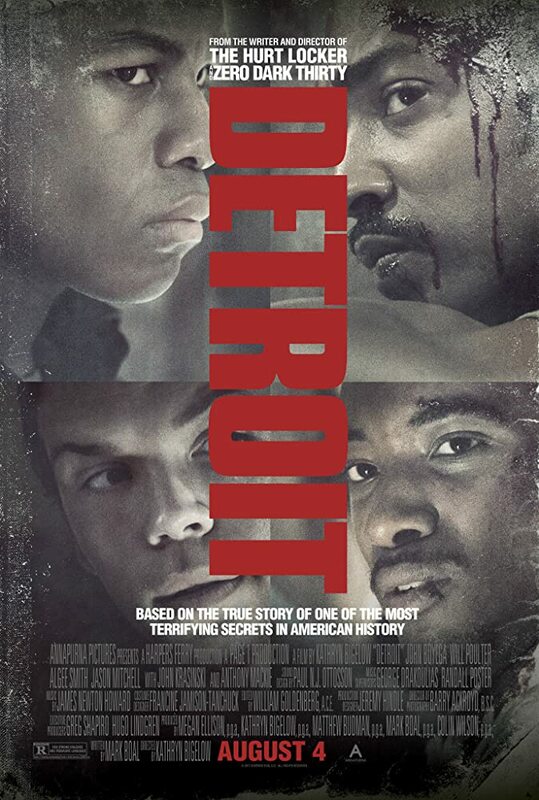 Detroit is a solid period thriller thanks to its impactful cast and bleak direction from Bigelow. It isn’t able to make as much of a statement as they’d hope thanks to its poor portrayal of the events and city of Detroit as a whole. Between the erratic tone and convoluted story, it isn’t able to reach its full potential. Regardless of its flaws, Detroit is still worthy of a watch due to its many technical achievements and stunning ensemble cast led by John Boyega and Will Poulter.